Finally a treatment that has both a holistic and medical approach to getting rid of your acne for good! We tailor our treatments for both adolescent and adult acne. In the UK, around 15 per 1,000 people have acne.The condition usually starts in adolescence and frequently resolves by the mid-20s.Severe disease can persist for 12 years or longer.Acne can have an impact on psychological well-being and this is where most of the problem lays. Acne isn’t just a teenage problem. It can continue into adult life – or even start for the first time in adulthood – with around one in ten of people having acne after the age of 25, and a few (1% of men and 5% of women) still having it in their 40s. 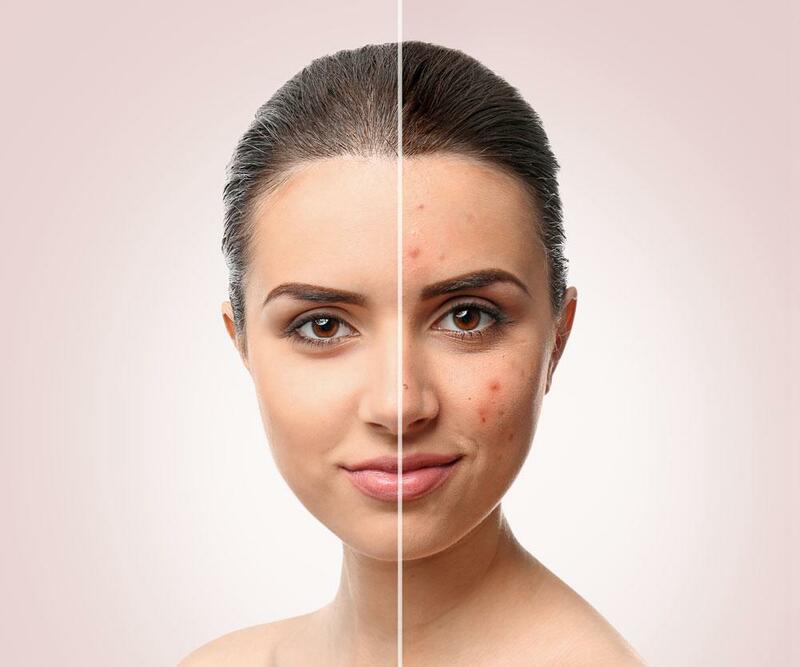 Women are far more likely to have acne during their early adult years than men, with more than eight in ten of cases of adult acne occurring in women. Can acupuncture help get rid of acne? Acupuncture helps kick start your body’s own natural detox process. This way you are eliminating toxins from both inside and outside. It also helps to balance out your hormones which as a result leads to reduction in stress levels. Acupuncture reduces acne inflammation by releasing vascular and immunomodulatory factors. It increases local microcirculation to disperse swelling. How does Acne acupuncture treatment work? Acupuncture uses needles to stimulate the nervous system and release neurochemical messenger modules.These result in biochemical processes that, in general, positively influence the body’s homeostatic mechanism and bring about complete mental and physical wellness. When certain pressure points on the body are stimulated, specific areas of brain associated with reduction in pain and stress are stimulated for overall health and wellbeing. Acupuncture acne points are specific from person to person and depend on the factors that are causing the acne. For example, some acne may arise from hormonal issues; still others might come from excess stress or bad diet.Hence the acne acupuncture treatment points also differ. At AcuCare Clinic we offer a bespoke treatment plan combining acupuncture and anti-acne skin peel. This treatment plan is unique to AcuCare Clinic and is our most in demand treatment. Our Acne Prescription protocol has been branded as the ‘clear skin and confidence booster’ by our patients and celebrity friends. You are guaranteed to see an improvement from day one. To start your journey to clear skin, please contact us for more info.